Calluses can be easily managed with a daily routine of exfoliation and moisturizing. There are many products available to make foot care easier, such as foot soaks, pumice stones and files. For those with severe or recurring problems, the occasional pedicure may be in order. 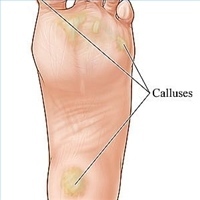 Of course prevention is always the most effective form of treatment, so if you are experiencing calluses, take care to protect your feet and adjust your posture so your weight is distributed evenly across the entire foot. Contact us today to learn more about calluses and what you can do to manage them.